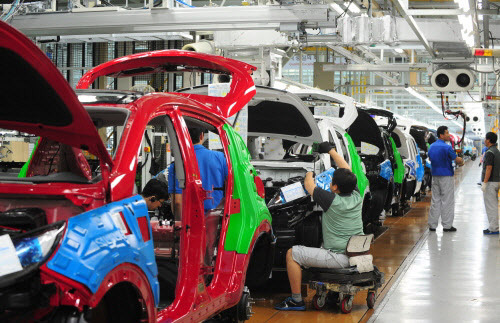 Korean automakers increased overseas production in the first half of this year but domestic production fell to the lowest since 2010. Overall car production in the first half fell two percent compared to the same period of 2015, leading to concerns over plummeting domestic sales in the second half. Korean carmakers rolled out 2.2 million vehicles in the first half of this year, down 5.4 percent compared to the same period of last year. Thanks to a temporary tax cut from five to 3.5 percent, domestic car sales rose 9.1 percent to 934,864 units. But low global oil prices and a global slump primarily in emerging markets led to a 13.3-percent decline in exports to 1.34 million units. Exports to the Middle East plunged 39.7 percent, to Asia 39.9 percent and to Africa dropped 55.7 percent. But thanks to the Korea-EU free trade agreement, shipments to the EU rose 2.4 percent to 165,814 units. But the number of cars Korean companies produced and sold overseas rose 2.7 percent to 2.2 million units. Hyundai and affiliate Kia built a new plant in Mexico in May of last year, boosting overseas output. But a ministry official said, "Even adding overseas output and sales, total production fell by around two percent."